Pearson, Jim A.. "Alberta Wheat Pool". 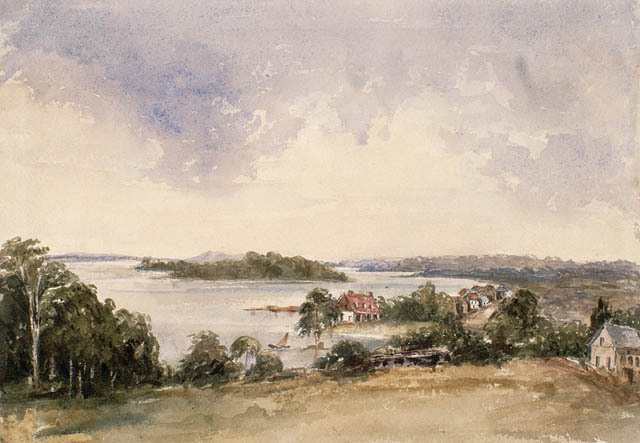 The Canadian Encyclopedia, 04 July 2016, Historica Canada. https://www.thecanadianencyclopedia.ca/en/article/alberta-wheat-pool. Accessed 18 April 2019. The Spruce Grove Grain Elevator that belonged to the Alberta Wheat Pool (courtesy Jim A. Pearson). 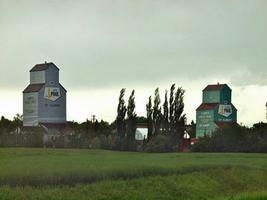 The St. Albert Grain Elevator that belonged to the Alberta Wheat Pool (courtesy Jim A. Pearson). The Esther Grain Elevator that belonged to the Alberta Wheat Pool (courtesy Jim A. Pearson). The Alberta Wheat Pool was an agricultural co-operative created in 1923 with its head offices in Calgary. The Pool was formed after plummeting grain prices forced farmers to sell their product at prices lower than their cost of production. All original members of the Alberta Wheat Pool contributed $1 per share, with 26 000 farmers initially joining the organization. 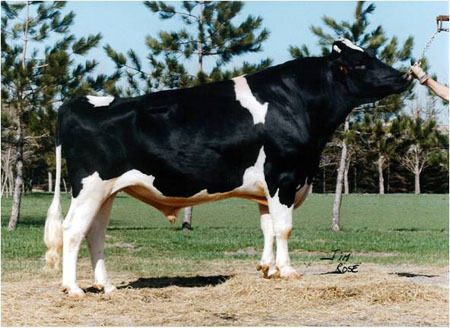 When legislation governing the pool was enacted, this money was refunded, and the pool became a service association with ownership resting with the operating grain farmers. The Pool was the first farmer's co-operative on the Canadian Prairies. During the first years of operation, companies like Alberta Pacific Grain and United Grain Growers agreed to process the first Pool deliveries through their own facilities. In 1925, the Pool built its first three grain elevators at Leo, Naco and Esther, along the CNR line, which ran from Warden, Alberta, to Biggar, Saskatchewan. Only Esther's elevator remains standing today. In the late 1920s, the Alberta Wheat Pool attempted to purchase United Grain Growers but failed. Instead, the company began to build more elevators and terminals. In 1930 the Pool opened its first BC elevator in Dawson Creek, and ended up building a total of 13 elevators (12 wooden and 1 concrete) in that province. By 1965, the Pool owned and operated 538 country elevators, and it took over 400 more from the Federal Grain Company Ltd. in 1972, thus becoming the second largest co-operative in Western Canada. In 1996 the sales of the Alberta Wheat Pool amounted to $2.1 billion (including grain purchased for and delivered to the Canadian Wheat Board); its assets were $625 million, and it had 1366 employees. The shares were held by 57 000 co-operative members. 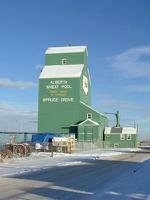 In 1998, the Alberta Wheat Pool and the Manitoba Pool merged to form Agricore Cooperative Limited. 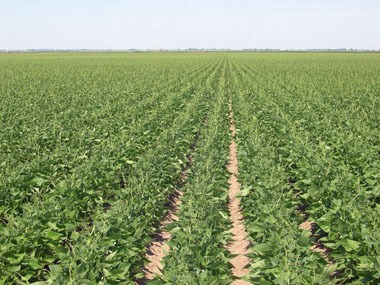 In 2001, United Grain Growers was combined with Agricore to form Agricore United, a publicly traded company. In 2007, the Saskatchewan Wheat Pool (another former farmer co-operative, which became a publicly traded company in 1996) took over Agricore United to form Viterra, and the head offices were moved from Calgary, Alberta, to Regina, Saskatchewan. This ended the companies' existence as farmers' co-operatives. 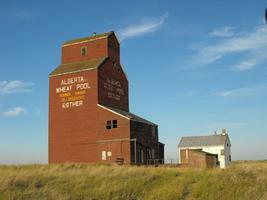 For nearly a century, the Alberta Wheat Pool elevators have been part of the province's cultural landscape. Of the hundreds of elevators that used to belong to the Pool, less than 50 remain standing today. Many of these are owned by farmers while a few have been saved as museums, showcasing a part of Alberta's agricultural past. Viterra, Inc.The website for Viterra, Inc., a widely held, publicly traded agri-business corporation which owns country and port terminal elevator facilities, 100% of Agricore, 100% of Can-Oat Milling, 100% ownership of Western Co-operative Fertilizers Limited, 42.4% of Prairie Malt Limited, and 64% of Prince Rupert Grain.